In the late eighties, the Italian cruise ship owner Costa Crociere designed a $900 million expansion plan. This included major refurbishments of some of her older units, such as the Enrico C and the Eugenio C and the conversion of two former Swedish container ships into two cruiseships: Costa Marina, delivered in July 1990 and Costa Allegra, handed over one year later. More than half of this huge investment was placed by Costa Crociere with Fincantieri Shipyard to build the 53,700 GRT Costa Classica and its sister Costa Romantica. The design of Costa Classica was a compromise between Italian design and North American market requirements, which accounts for half of the company's business. This plan doubled Costa Crociere capacity form 4,300 berths in 1989 to 8,500 in 1994, which was then seven per cent of the world market. These figures meant that Costa was the fifth operator in that year after Carnival, RCCL, Kloster and P&O. Also, Costa Crociere wanted to exchange its image in the States and their new ship was the first marketing move using the Euro-Luxe brand name, with a more European image, rather than one which is purely Italian in character. The goal was to compete in the upper segment of the mass cruise market, against HAL, Princess and Celebrity and to increase the income derived from the American market to 60%. This strategic move meant the loss of the Italian Register and it didn't work as expected. Costa Romantica and Costa Victoria were delivered later and this compromised the image of Costa's prestige, furthermore a market with heavy discounts and the late delivery meant that Costa Crociere was too small to be a global cruise operator. So, Costa Crociere was purchased by Carnival Corp. and Airtours for $300 million in December 1996. The new owners did not change the itineraries and also life on board remained unchanged. I think the fact that Carnival didn't change itineraries is very important. The first agreement to build the Costa Classica and her sister was signed with Fincantieri in July 1987. The definite construction contract was signed on 4 December 1987 and the ship contract value was $287 million. She was built in the Monfalcone yard where, 24 years ago, the Eugenio C, the former Costa Crociere flagship was also built. Costa Classica was launched on 2 February 1991 at the Monfalcone dock and, following a successful sea trials, was delivered in December that year. She was presented to the travel agents and the maritime media in Venice on 7 June 1991 in a christening ceremony where the godmother was Emilia Costa. The Costa Classica's first cruise was the 1991 Christmas voyage on 17 December 1991 which was from Genoa to Western Mediterranean. Later she crossed the Atlantic and sailed to Florida. There, on 25 January 1992, she began a series of seven night cruises from Miami to the Caribbean. This cruise patter has been the same since that year. From April to November she cruises in the Mediterranean, mainly from Venice to the Greek Isles, and in winter time she sails in the Caribbean, but mainly with Europeans passengers. The Costa fleet isn't based in the same area for the entire year and this means that the ships must be completely interchangeable due to passengers from two very different markets. This complicates the design and the operation of the ships. On 19 July 1997, the Costa Classica was grounded, with 1500 passengers on board, in Kythira, Greece, due to strong winds that broke the ship's anchors. Later, with tug assistance, she was refloated and, after an inspection of the hull, she continued the cruise. The Costa Classica came from the desk of the well know Italian designer Gregotti Associati. The final design was a traditional passenger ship, with some high-tech touches. The conservative aspects are highlighted by massive use of portholes, the position of lifeboats and tenders with the associate davits, the cylindrical stacks, open decks railings, etc. The most striking outside feature is the circular glass enclosed disco forward of the superstructure, which also contains all the communication antennas and the radar mast. It's clearly takes after RCCL's Viking Crown, but situated in a forward place. This disco form hasn't been repeated in the following Costa's cruiseships, which feature a more conventional forms in the forward end of the superstructure. Altought well balanced with three stacks aft, the ship's lines would have been improved if this space had followed the profile of the ship's gymnasium above the navigation bridge. The whole external design is strong, angular, far from the very pleasant lines of the old Eugenio C.
The superstructure, following the trend of modern cruiseships and ferry design, extends far forward, altough with an elegant slope, and spreads fully aft in order to obtaain more space but the box-like appareance is a sore sight. The use of portholes on her lower decks and rectangular windows on the upper decks (like an old sheltered promenade deck) gives a sense of strength, whereas the lifeboat arrangement on the upper deck gives an impression of a lower height. This touches are of traditional liner design, but the overall shape is box-like. All this features make Costa Classica's exterior shape easily recognisable. Only the group of the three tall funnels was a real success, and is repeated in every new Costa cruiseship including the brand new Costa Atlantica. The fact that the whole interior design was the work of only one architect means that the ship has some clear pattern such as the use of marble and red and green colours... and the fact that the designer wished to emphasise the use of circles. The disco, all cabin windows, windows in the dining room, coffee bar, shop gallery, buffet, library, etc. are all round. The finest materials are used on board such as Myrano glass, Carrara marble, stucco decors, etc. Her general layout follows the pattern of the Carnival Cruise Lines' Fantasy class cruise ships: all the cabins are on the lower decks, with two decks of public spaces under the pool deck. Only the suites are located in a different place respect to the Fantasy class. The atrium isn't so spectacular as on Sovereign of the Seas or on the Fantasy class that were built in the same period. It begins on deck five, above the main lobby and reaches deck nine. Due to the position of the cabin arrangement the first two decks lack natural ligtht although plenty of bright bulbs have been used. The designer should have provided the ship with inside cabins with windows facing the atrium, hence making good use of the wasted space. Its decoration is plain, almost cold, with only a round sculpture by Arnaldo Pomodoro in the base. Even though the embarkation is through the lower deck of the atrium it doesn't work well as a meeting point on board because it is far from the lifts and stairs. Furthermore the cabins are situated above and below. As a consequence, the atrium looks like a cargo hatch, rising from hull to sky, which is really an illuminated ceiling. All this gives the area a garish look which lacks life and light. 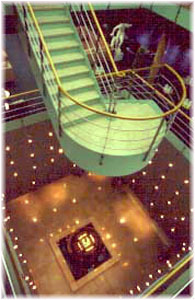 Only on the two upper decks (8 and 9), which are connected through a "floating" staircase, the atrium seems to have a better use. The stairs, which basically run all the way from deck 3 to deck 12 are all panelled with light weight green marble and look pleasant. On the top deck the forward stairs have a glass ceiling which adds a lot of natural light on the upper decks. I found this arrangement very interesting. The Costa Classica has a good passenger flow, with the main activity center, Piazza Navona, on deck 8, located between the Colosseo theater forward and the Tivoli dining room aft. 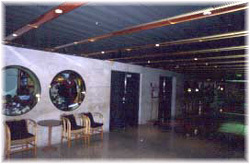 This full width space has a bar port side, a stand for the piano with a dance floor, and a suspended staircase linking the area with the pizzeria one deck above. Only the Portofino deck isn't viable from bow to stern and if you want to go to the gym from the suites you have to go up or down one deck to reach it. 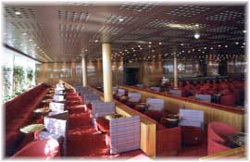 The Tivoli dining room is located on deck 8 adjacent to the galley positioned aft. 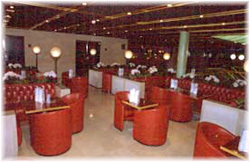 The restaurant decoration is different from the rest of the ship, with the exception of the marble floor; there are green marble zones, that don't meet properly in the decoration scheme. the separation between tables is adequate. The best thing about the dining room is its magnificent indirect lighting, as well as the natural illumination due to the round windows on both sides. The air conditioning system is very noisy. The indoor-outdoor buffet is the alternative but it has lifeboats hanging in front of the round windows in its indoor section making it darker and obscuring the view of the sea. The outside part is excellent, and the sails aft have become another of Costa's trademark. The 700-seat two deck high Colosseo theatre has the atmosphere of a 15th century auditorium. 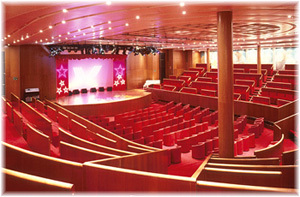 The theatre has an amphitheater layout, and the decoration is mainly red. It has a magnificent view in spite of ten existing pillars. The red seats seem more adequate for an airplane than for a deluxe ship, and the small "tables" don't look very good. It seems more like a conference room than a cabaret. Only the ground level has adequate furniture, with real tables and suitable chairs. The back of the upper level corridor is decorated with a vast mosaic of different themes, all over a blue background, from a design by the Italian artist Emilio Tadini. This gives a great personality to this area and produces a magnificent contrast with the red upholstered furniture and the black ceiling. It has a bar in the lower deck, it is also decorated red with splendid furniture. The Costa Classica has two pools: the forward one is small and has a fountain, with adequate sunbathing space. 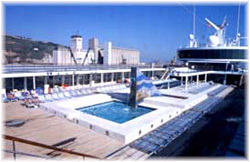 The aft pool has two jacuzzis, a small stage and is surrounded by terraced teak deck, as on the old Conte Di Savoia. This traditional aft arrangement is very nice. in the Alfresco Cafe', traditional canvas and teak deck, as well as modern stainless steel tubular frames, are used to create a splendid outdoor cafe', sheltered from the sun. This arrangement later became a Costa trademark. This large area, with seating for some 200 people, is the favourite outdoor spot for many people. The wicker deck chairs and other furniture is very good, with thick green pads. Other owners, such as Celebrity and Royal Hispania in its old D. Juan, later used this "sail" structures. She lacks a full round outside deck and I think this compromises her overall stern shape. The full width Puccini Ballroom, which is a beautiful room with a marble bar and picture windows on three sides, would be more useful in day time as a second level of the Alfresco Cafe', with a terraced arrangement instead of dance area for the night. The Costa Classica has accommodation for 1,766 passengers (all berths), but usually only carries 1,300. Her 654 cabins include 428 outside, 216 inside and 10 suites. 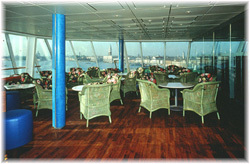 The cabins are located within the hull, on the lowest decks (4 to 7). The standard cabin has a surface about 16.6 square metres and its main feature is its large porthole as well as its nice and modern furniture, luxury linens and high quality fabrics, teak or cherry wood trim and veneers. Standard equipment includes two lower beds, colour television, telephone and minibar. There are a lot of cabins with extra Pullman berths to accommodate families. The bathrooms are very nice, with a big marble vanity and a round shower. There are ten 31.5 square metres suites with round balconies on deck ten. These suites have 18 mm. marble floorings and are among the most spacious and elegant you can find afloat. They have fine furnishings, specially the bathroom, with marble walls and floors, jacuzzi, and separate shower. After her delivery, the Costa twins were undoubtedly the Queens of the Mediterranean. They were the largest and most luxurious cruise ships on the market. In the winter season they competed in the Caribbean, and so their role wasn't the same. The Euro-Luxe brand name didn't work as expected and the two ships did not meet the American expectations in the upper market. So Costa Classica and her sister had to compete with the new fourth generation panamax cruiseships of the Sovereign of the Seas and Fantasy types, in the heavily discounted mass market. All these ships could accommodate more than 2,000 passengers and, as a consequence, have cheaper operational ratios. The Costa's sisters had lower capacity than their competitors, but higher passenger to crew and GRT to passenger ratios. Also, they have do two transatlantic positioning voyages every season, whereas the RCCL and Carnival ship were full time Caribbean ships. All the Costa Classica's cabins, with the exception of the suites, are located on the lower decks, within the hull and, as a consequence, the ship lacks cabins with balconies. 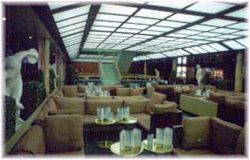 In contrast, all new generation cruiseships of competitors like HAL, Princess, etc., operating in the de luxe market, were fitted with entire decks with balcony cabins. For example, HAL's Statendam class, built in the same yard and which had the same hull, has two decks of balcony cabins. So it was very difficult to compete in the American market. The lack of balcony cabins meant that the two Costa's ships have to compete against Carnival and RCI in the mass market featuring strong discounts. Furthermore Costa can't operate with the economy scale of the "Big Two" owners. The Costa Classica and her sister have an intermediate service speed of 19.5 knots, based on a geared medium speed diesel-mechanical propulsion plant. At this speed the Costa Classica could easily make a cruise to the Greek Islands from Venice and also her winter Caribbean schedule from Guadeloupe. But, in 1999, due to the Kosovo War, she couldn't make the Greek Island trips from Genoa because of her insufficient speed. On the other hand her fleet mate, the faster Costa Victoria, could make it. Due to her low cruise speed she isn't beeing exploited as much as she should. When Costa Classica was delivered, almost all cruise ships of this size were powered by a diesel-electric plant, and had a service speed well over 20 knots. As a matter of fact, of the twenty cruise ships that Fincantieri has delivered since 1990, only the Costa twins were not powered by a diesel-electric propulsion. To correct these errors, the Costa Classica might undergo the most radical transformation done on a modern cruise ship. The rebuilding comprises both to lengthen and to add an extra deck to the 1991 built Costa Classica. Cammel Laird was awarded with the $84.15 million contract, one of the biggest ever signed for this purpose. In recent years other modern, but small cruise ships, have undergone the same operation: the Norwegian Wind and Norwegian Dream sisters, and the Norwegian Majesty, all carried out in German yards. - and, of course, you lower the operating cost per guest and per mile. The Costa Classica should have entered in Cammel Laird's Merseyside docks on November 23. Then, she should have been cut in two and then a new 44.8 metres midship section should have been inserted, which would have increased her length to 265.4 metres. Six new generators and switchboards, as well as a larger sewage and air conditioning plants should have been installed on her lower decks. On her upper decks, the existing Lido deck should have been raised and another swimming pool, with four jacuzzis, added. Furthermore around 352 new passenger cabins and 132 crew cabins should have been provided and new passenger facilities such as a piano bar, a Winter Garden Bar, two additional lounges, a teen area, and a Internet Cafe' should have been built. In order to increase her service speed her existing diesel-driven twin screw propulsion system was to be retained with the addirion of a new 8 Mw podded drive, mounted centrally between the two rudders, which were also to be retained. The extra added power would have more than compensated for the extra weight of the stretched vessel and would have increased the ship'speed to around 23 knots. The existing propeller blades would have been adapted for a higher speed. The use of the pod eliminates the need for stern thrusters and reduces noise and vibrations due to its twin small diameter propellers. One additional forward thruster would have been added. The work had to be finished on 22 March 2001 a date that would have enabled the ship to fullfil her summer Mediterranean season. Then, the Costa Classica would have increased her gross tonnage from 53,000 to around 79,000 and her maximum passenger capacity from 1,764 to 2,516. During the voyage between Genoa and Liverpool, while off La Coruña, Spain's Nort-West coast, Costa Classica's Captain received the order to return to her homeport. Costa motived the decision saying that there was a delay by Cammel Laird and that there was a notable risk that the contract could not be completed within the scheduled 17 weeks. Costa added that had not been possible to find a solution through normal business agreements. The contract is subject to Italian law and the arbitrations is to be held in Genoa. Actually the Costa Classica is laid up in Genoa and the probability that she will be lenghtened in the near future is very remote. The Cammel Laird's shares lost more than a third of their value, and up to 2,000 jobs are under threat. The new midship section was launched on 26 November 2000, and now it lies idle in Birkenhead. For many people it will be never "pasted" to the Costa Classica. The ship, and her sister Costa Romantica, need to be modified in order to compete with the new rivals both in the Mediterranean (specially the ships of Festival Cruises) and in the Caribbean areas. With the planned changes and with the traditional Costa's service and hospitality, the Costa Classica will be a winner in the 21st century cruise market. She will become the perfect mate of the brand new Costa Atlantica, delivered this year, both in term of size and facilities. The ship is a "floating embassy" of Italian style and design and isn't over-decorated like some of the latest cruise ships. Marble, brass, glass, etc. made Costa Classica one of the most exciting ship in terms of design and decoration during the last years, and her planned refitting will enhance this fact.